When a young woman kills the man who raped her, she suffers the tragic consequences after returning from prison to the small North Carolina town where the murder took place. A poor country girl tries to rebuild her life after murdering the boy who date-raped her in this Southern Gothic tale straight from the heart of rural America. Blending murder and revenge with themes of redemption and grace, Lake of Fire weaves together the lives of three damaged characters, Lucy Speckle (brilliantly portrayed by newcomer Ariel Burke), just home from prison and ready to mend her ways; her alcoholic preacher father, Ray Speckle (portrayed by Billy Ingram); and a broken-hearted cowboy, Lester Hollis (portrayed by Chris Best). 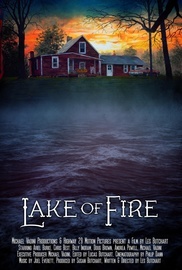 Inspired by Flannery O'Connor and the Coen Brothers' films, Lake of Fire has been called a "southern masterpiece" (Betty Austin-Ware), capturing the beauty of North Carolina and the simplicity of life in a small southern town, reminiscent of movies such as Black Snake Moan and Winter's Bone. Other notes: Lake of Fire was shot by Philip Dann, produced by the Butchart family (Highway 29 Motion Pictures), and features Andrea Powell (Twilight Saga, Ender's Game) Doug Brown as Sheriff Carl Clancy, Logan Anderson, Hannah Burke and Slade Blackburn. $25 VALUE if purchased separately: books, music and short film in one happy package!